I'm always looking for quick weeknight meals that can be made from scratch without too much time involved. I may be tired when I get home from work, but it doesn't mean I want to sacrifice taste or the joy of creating something out of the ingredients found in my fridge. It's just so much more gratifying than throwing some pre-made dish in the microwave for two minutes. That's not to say my microwave doesn't come into use, but something like this simple stir fry will save me from it on most nights. This recipe calls for mixed stir fry veggies. I use bok choy, sugar snap peas and snow peas, but it works just as well with whatever veggies you prefer or you happen to find in your fridge. Mix together the honey, flour, vinegar and soy sauce in a small bowl and set aside. Heat a wok over high heat and add the sesame oil to heat through. Add the veggies and stir fry for 3-4 minutes until beginning to soften. Add the shrimp and the soy mixture to the wok and stir fry until the shrimp is cooked through and the sauce has thickened into a nice sticky stir fry consistency. Serve up into two bowls and enjoy! I love stir-fry for those nights when you don't have much time to cook and, like you say, it can pretty much be adapted to whatever veggies happen to be in the fridge. My fav is broccoli stir-fry, but your combo looks delicious! Stir fry is great when you need to put a meal on the table quickly...or clean out the veg bins, or if you only have a little bit of meat/seafood. We live on them in the summer months. They cook so quickly and the stove never gets the chance to heat up the house. 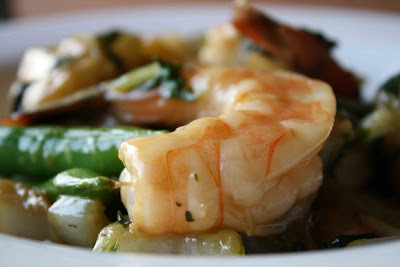 Shrimp and stir-fry...2 of my favorite words. This sounds perfect! I love the combination of soy and rice vinegar. It creates such a yummy flavor! Super-easy and delicious. Can't be that for a weeknight meal! What a mouth watering photo! Yum! Hopie - broccoli sounds delicious. Do you shred it or use it whole? Michele - true, true - they're great for throwing in the kitchen sink aren't they? Meg - shrimp is my favorite kind of stir fry! Bridgett - super easy and super gratifying. Hard to get on most weeknights! Kristen - I sent you an e-mail. Let me know if you don't receive it. Thanks!